Chinese President Hu Jintao touched down in Washington on Tuesday afternoon, beginning his four-day official visit to the United States. He then joined US President, Barack Obama, for a private dinner at the White House. Touching down at Andrews Air Force Base outside Washington, Chinese President Hu Jintao kicked off his second visit to the US as head of state. China's President was welcomed by US vice president Joe Biden. on Jan. 18, 2011. Hu Jintao landed here Tuesday for a four-day state visit. In a written statement released upon his arrival, Hu said the purpose of his visit would be to enhance mutual trust, promote friendship, deepen cooperation and move forward the positive relationship between the countries in the years to come. Hu also praised the momentum of growth in Sino-U.S. relations over the past three decades and said cooperation has brought tangible benefits to each nation's citizens. President Hu also hoped that both sides could help promoting peace, stability and prosperity in the Asia-Pacific region and beyond. During the visit, President Hu is expected to map out a blueprint with his U.S. counterpart Barak Obama for China-U.S. cooperation for the new era. President Hu Jintao was welcomed by Chinese students studying in the United States, and Chinese entrepreneurs on his way out of the airport. Hu Jintao met with Barack Obama at the White House Wednesday and made a five-point proposal for enhancing bilateral ties. WASHINGTON, Jan. 19 (Xinhua) -- Chinese President Hu Jintao met with his U.S. counterpart Barack Obama at the White House Wednesday and made a five-point proposal for enhancing bilateral ties. Both leaders expressed their dedication to developing a cooperative partnership based on mutual respect and mutual benefit. They also mapped out major directions for bilateral ties as well as key areas to deepen cooperation. Hu, who arrived here Tuesday on a state visit to the United States, told Obama the development of China-U.S. ties needs new ways of thinking, new actions and new climate. China is willing to work with the U.S. side to enhance dialogue, boost mutual trust, expand exchanges and deepen cooperation so as to open up a new prospect for bilateral partnership, he said. Hu put forward a five-point proposal for furthering bilateral ties. Firstly, the two sides should develop a political relationship of equality, mutual trust and seeking common ground while reserving differences. As long as both sides maintain dialogue and cooperation, treat each other in an objective and rational manner, and respect each other's choice of social system and path of development as well as each other's sovereignty, territorial integrity and development interests, bilateral ties will stay on the right track, he added. Secondly, Hu said both sides should deepen their comprehensive, cooperative, mutually beneficial and win-win economic ties. China is ready to work with the U.S. side to carry out comprehensive economic cooperation, jointly ease trade imbalance, advocate free trade, oppose protectionism, boost the development of bilateral trade and economic ties, and push the Doha Round of global trade talks to achieve substantial results as soon as possible. China will continue to provide completely fair national treatment to U.S. investors in China, and hopes the U.S. side will relax its restrictions on high-tech exports to China, offer an environment of fair competition to Chinese enterprises investing in the U.S., and adopt active measures to recognize China's full market economy status, Hu said. He also urged both sides to deepen cooperation in new energy and infrastructure construction. Thirdly, Beijing and Washington should jointly meet challenges through global cooperation, Hu said. Fourthly, China and the U.S. should further their friendship with the extensive involvement of both peoples, Hu said. Meanwhile, Hu hoped that the two sides will smoothly launch the China-U.S. Governors' Forum, a new initiative aimed at promoting bilateral practical cooperation at the local level. Fifthly, the two sides should establish a high-level contact pattern featuring in-depth communication and candid dialogue, Hu said. Both sides also should continue to be creative and conduct timely communication on bilateral relations and other major sensitive affairs and expand consensus, he added. Obama, for his part, said Washington attaches great importance to its ties with Beijing, and is willing to further strengthen bilateral ties on the basis of mutual respect and mutual benefit. The U.S. president said that he fully agreed to Hu's proposal and that his country is ready to work together with China to enhance high-level contact, deepen strategic mutual trust and boost cooperation in efforts to boost world economic growth, enhance the nonproliferation of weapons of mass destruction and address climate change and other issues. Washington is also willing to make full use of the framework of the U.S.-China Strategic and Economic Dialogue to enhance mutual understanding and resolve differences through dialogues, he added. In the 21st century, many multilateral issues need U.S.-China cooperation, Obama said, adding that the United States appreciates China's important role in dealing with climate change. The United States welcomes China's rise, and China's peaceful development benefits the United States and the whole world, he added. Obama reaffirmed that the United States will adhere to the one-China policy and abide by the three Sino-U.S. joint communiques. The Chinese president appreciated Obama's stance. At the joint press conference following the summit, Hu said that he reached important consensus with U.S. President Barack Obama during the talks, and both sides agreed to strengthen exchanges and cooperation in economy and trade, energy and environment, science and technology, infrastructure construction, culture and education, counter-terrorism, non-proliferation, law enforcement and other areas so as to achieve mutual benefit. Saying his talks with Obama were conducted "under candid, pragmatic and constructive atmosphere," Hu said China appreciates Obama's commitment to a positive and constructive China policy, and to stable and growing China-U.S. relations since he took office two years ago. Hu noted that China and the United States share expanding common interests and shoulder increasing common responsibilities, and voiced support for expanding military exchanges between the two sides. On the situation on the Korean Peninsula, he said both countries agreed to work together with relevant parties to maintain peace and stability on the peninsula, promote denuclearization of the peninsula and achieve lasting peace and security in Northeast Asia. The Chinese leader reaffirmed China's firm commitment to the path of peaceful development and a win-win strategy of opening up, saying "China is a friend and partner of all countries, and China's development is an opportunity for the world." Meanwhile, Hu said he and Obama discussed some disagreements in the economic and trade area, with both sides pledging "to continue to appropriately resolve these according to the principle of mutual respect and consultation on an equal footing." At the press conference, Hu also called on China and the United States to work together to tackle global challenges, citing terrorism, security of humanity, international financial crisis and growth of the world economy while calling for increased people-to-people exchanges. After their official talks, the two sides issued a joint statement, which said that the two countries have agreed to build a cooperative partnership based on mutual respect and mutual benefit, reaffirming their commitment to building a positive, cooperative, and comprehensive China-U.S. relationship for the 21st century. "The United States reiterated that it welcomes a strong, prosperous, and successful China that plays a greater role in world affairs," it said. Both sides underscored the importance of the Taiwan issue in China-U.S. relations. The Chinese side emphasized that the Taiwan issue concerns China's sovereignty and territorial integrity, and expressed the hope that the U.S. side will honor its relevant commitments and appreciate and support the Chinese side's position on this issue. The U.S. side stated that the United States follows its one-China policy and abides by the principles of the three joint communiques. China and the United States reiterated their commitment to the promotion and protection of human rights, even as they continue to have significant differences on these issues. China and the United States affirmed that a healthy, stable, and reliable military-to-military relationship is an essential part of President Hu's and President Obama's shared vision for a positive, cooperative, and comprehensive China-U.S. relationship. Pledging to strengthen macroeconomic communication and cooperation in support of strong, sustainable and balanced growth in the two nations and the global economy, the two sides also recognized the importance of open trade and investment, and vowed to oppose trade protectionism. China and the United States also agreed to continue their close consultations on action addressing climate change. Before holding talks with Obama, Hu attended a welcome ceremony on the South Lawn of the White House hosted by President Obama, at which also present were U.S. Vice President Joe Biden and Secretary of State Hillary Clinton. On Wednesday evening, an opulent state dinner, the grandest of White House soirees, was hosted by President Obama in Hu's honor. Chinese President Hu Jintao wrapped up his visit to the United States, ending a two-day stay in the Midwest city of Chicago after an official state visit with President Obama. Hu met with business, government and cultural leaders who say the Chinese president's visit is a chance to strengthen ties between the Midwest and China, which is the world's most populous country. President Obama said he wants to open up Chinese markets to U.S. companies to have two-way trade, not just one-way trade. Many of those companies are in the Midwestern region where Chicago is located, and where Chinese President Hu Jintao wrapped up hi high-profile U.S. visit. During his visit in Chicago, Chinese President Hu Jintao visited the Walter Payton College Preparatory High School, known as one of the best public high schools in the city. The high school is home to the Confucius Institute (CIC) in Chicago, an educational partnership between the Chinese Ministry of Education and Chicago Public Schools that promotes Chinese language and culture. Yang Jingyue is director of the five year-old Confucius Institute. Because of a spike in the number of Chicago Public School students choosing to study Chinese, many of the young people at the event knew what President Hu was saying before many of the adults did. The Chicago students recognized the historic significance of the Chinese president's visit and reveled in the international spotlight. "I hope all the students here will value your precious time, study hard, enrich your lives and lay a full foundation for your future career and lives," said Hu before presenting books and audio resources to the institute. An hour after the Chinese President arrived, he was whisked away to a business exhibition in a west suburban Woodridge warehouse. There representatives of 11 companies — some Chinese companies with offices in the United States, others American firms with business in China — set up displays to highlight the growing business cooperation between the two countries. President Hu Jintao conducted an interview Monday with the Wall Street Journal and the Washington Post. The dialogue comes a day before his state visit to the US. During the interview, President Hu highlighted a number of points to further advance China-US ties. He says both countries should increase dialogue and contact, enhance strategic mutual trust and abandon the zero-sum Cold War mentality. He also suggests both countries respect each other's sovereignty, territorial integrity and make constant efforts to expand both countries' converging interests. Hu also says China would firmly continue with its opening-up policy and work with the international community to contribute to the overall recovery of the world economy. Jan. 17, 2011 - Chinese President Hu Jintao on Monday elaborated on points to further advance China-U.S. ties. "We both stand to gain from a sound China-U.S. relationship, and lose from confrontation," said Hu, who is to pay a state visit to the United States from Tuesday to Friday, in a written interview with reporters from Wall Street Journal and Washington Post on Monday. "We should act in the fundamental interests of our two peoples and uphold the overall interests of world peace and development. We should rise up to challenges, remove disturbances, work for shared goals and promote continuous growth of our relations," Hu said. "First, we should increase dialogue and contact and enhance strategic mutual trust. Second, we should abandon the zero-sum Cold War mentality, view each other's development in an objective and sensible way, respect each other's choice of development path, and pursue common development through win-win cooperation," Hu said. "Third, we should respect each other's sovereignty, territorial integrity and development interests and properly address each other's major concerns. And fourth, we should make constant efforts to expand our converging interests so that China and the United States will be partners for cooperation in broader areas," he went on. Since the beginning of the 21st century, thanks to the concerted efforts of both sides, China-U.S. relationship has on the whole enjoyed steady growth, Hu said. "Since U.S. President Barack Obama took office, we have maintained close contact through exchange of visits, meetings, telephone conversations and letters," Hu said. "We agreed to build a positive, cooperative and comprehensive China-U.S. relationship for the 21st century and together, we instituted the China-U.S. Strategic and Economic Dialogues mechanism," Hu said. "The strategic significance and global impact of China-U.S. relations have been on the rise," Hu said. Over the past two years, China and the United States have carried out practical cooperation in a wide range of areas including economy and trade, energy, the environment, counter-terrorism, law enforcement and culture. The two countries have maintained close contact and coordination in dealing with major international and regional hotspot issues and addressing global challenges, such as climate change and the international financial crisis, Hu said. China and the United States have major influence in international affairs and shoulder important responsibilities in upholding world peace and promoting common development, Hu said. "Under the new circumstances, the common interests of our two countries have been growing and areas of cooperation expanding," Hu said. Hu said there is great potential for China-U.S. mutually beneficial cooperation in advancing Asia-Pacific regional cooperation and in improving global economic governance and promoting sustainable growth of the world economy. There is also great potential in expanding cooperation in economy and trade and in strengthening cooperation in new areas like new and clean energy, infrastructure development and aviation and space, Hu said. Great potential of cooperation also exists between the two nations in fighting terrorism and in preventing the proliferation of weapons of mass destruction and in meeting challenges like natural disasters, food security and major communicable diseases. "There is no denying that there are some differences and sensitive issues between us," Hu said. "Both sides should keep to the right direction in the development of our relations, increase exchanges, enhance mutual trust, seek common ground while reserving differences, properly manage differences and sensitive issues and jointly promote the long-term, sound and steady development of China-U.S. relations, " he said. BEIJING, Jan. 17 (Xinhua) -- China said on Monday it will adhere to the win-win strategy of opening-up and work with the international community to contribute to the overall recovery of the world economy. President Hu Jintao made the commitment in his written interview with the Wall Street Journal and the Washington Post prior to his state visit to the United States. "China will pursue the win-win strategy of opening-up and stands ready to work with the United States and the international community as a whole to intensify practical cooperation, properly handle various risks and challenges, and make greater contribution to the overall recovery of the world economy," Hu said. China took a pack of measures to address the impact of the international financial crisis, which inflicted on the country "unprecedented difficulties and challenges", he said. China quickly adjusted its macro-economic policies, resolutely adopted the proactive fiscal policy and moderately easy monetary policy, put in place a package plan to boost domestic demand and stimulate economic growth, significantly increased government investment, implemented industrial readjustment and reinvigoration plans on a large scale, energetically promoted scientific innovation and technological upgrading, raised social welfare benefits by a substantial margin and introduced a more active employment policy, according to Hu. "As a result, China's economy in 2009 and 2010 maintained steady and relatively fast growth and contributed to the economic recovery of the region and the world," Hu said. The president said China will take scientific development as the main theme and focus on transforming the economic development pattern at a faster pace. China will implement a proactive fiscal policy and a prudent monetary policy, speed up economic restructuring, vigorously strengthen indigenous innovation, make good progress in energy conservation and pollution reduction, continue to deepen reform and opening-up, work hard to ensure and improve people's livelihood, build on the achievements in addressing the international financial crisis, maintain steady and relatively fast economic growth, and promote social stability and harmony, he said. China is calling on the international community to further reform the global financial system, in order to ensure more balanced partnerships and economic development. In a written interview with American media prior to his state visit to the U.S., President Hu Jintao says China is working to improve laws and regulations regarding foreign investment. He also assures the country is strengthening its intellectual property protection framework, and endeavoring to build an open and stable environment for overseas investors. BEIJING, Jan. 17 (Xinhua) -- Chinese President Hu Jintao said Monday that the monetary policy of the United States has a major impact on global liquidity and capital flows. Hu made the remarks in an written interview with reporters from Wall Street Journal and Washington Post before his upcoming state visit to the United States, due to start Tuesday. "Therefore, the liquidity of the U.S. dollar should be kept at a reasonable and stable level," Hu said. According to Hu, the current international currency system is the product of the past. As a major reserve currency, the U.S. dollar is used in considerable amount of global trade in commodities as well as in most of the investment and financial transactions. "It takes a long time for a country's currency to be widely accepted in the world," he pointed out. China has made an important contribution to the world economy in terms of total economic output and trade, and the Chinese currency, the Renminbi(RMB), has played a role in the world economic development, he said. "But making the RMB into an international currency will be a fairly long process," he added. "The on-going pilot programs for RMB settlement of cross-border trade and investment transactions are a concrete step that China has taken to respond to the international financial crisis, with the purpose of promoting trade and investment facilitation," he said. "They fit in well with market demand as evidenced by the rapidly expanding scale of these transactions," he said. BEIJING, Jan. 17 (Xinhua) -- China on Monday called on the international community to further advance the international financial system reform, and to build a new and more equal and balanced global partnership for development. "China hopes that the international community will work together to further advance the reform of the international financial system and move toward the establishment of a fair, just, inclusive and well-managed international financial order," President Hu Jintao said in his written interview with the Wall Street Journal and the Washington Post prior to his state visit to the United States. First, the international financial system had not kept up with the latest development of economic and financial globalization and was incapable of tackling the risks and challenges brought about by massive financial activities. Second, international financial institutions failed to fully reflect the changing status of developing countries in the world economy and finance. Their global representativeness and enforcement capabilities need to be further strengthened. Third, the international financial system was in serious shortage of resources and means to tackle the international financial crisis and its rescue capabilities need to be built up. Hu called on the international community to not only address specific issues such as managing properly the relationship between the financial sector and the real economy, between financial innovation and financial supervision and regulation, and between consumption and saving, but also, and more importantly, review those fundamental problems in the world economy on a macro level. Saying the serious development imbalance between the North and the South as the "most prominent problem in the world's economic imbalance", Hu urged the international community to endeavor for a new and more equal and balanced global partnership for development, and to encourage developed and developing countries to have more mutual understanding and closer coordination, so as to promote the strong, sustainable and balanced development of the world economy. BEIJING, Jan. 17 (Xinhua) -- People's democracy is the life of socialism and China is committed to the development of socialist democracy, Chinese President Hu Jintao said on Monday. "Without democracy, there can be no socialist modernization," Hu said in a written interview with reporters from both Wall Street Journal and Washington Post before his upcoming state visit to the United States, due to start Tuesday. "To develop socialist democracy is a goal we have always been committed to," Hu said. China's reform is a comprehensive one, covering economic, political, cultural and social restructuring, according to the Chinese leader. In the past 30-plus years since reform and opening-up, notable progress has been made in China's political restructuring, Hu said. The fact that China has enjoyed sustained, rapid economic growth and social stability and harmony proves that China's political system fits China's national conditions and meets the requirement of overall economic and social development, he said. "Political restructuring must deepen in the course of economic and social development and meet people's growing enthusiasm for participating in political affairs," he said. BEIJING, Jan. 17 (Xinhua) -- Chinese President Hu Jintao said Monday that China would stay firmly committed to the opening-up policy and actively and effectively use foreign investment. Hu made the remarks in a written interview with the Wall Street Journal and Washington Post ahead of his state visit to the United States. The use of foreign investment is an important part of China's basic state policy of opening-up, he said. "We will actively and effectively use foreign investment, improve its structure, diversify its form, and open up more channels and sectors so as to facilitate investment," said Hu. China would continue to improve laws and regulations concerning foreign investment, strengthen protection of intellectual property rights (IPR), promptly address the legitimate concerns of foreign companies and facilitate the growth of enterprises of all kinds in China by offering them a stable and transparent legal and policy environment, a consistent and open market environment as well as a standardized and efficient administrative environment, said Hu. Hu said China had fully honored its commitments by abolishing all domestic laws and regulations incompatible with the World Trade Organization (WTO) rules and giving foreign companies national treatment over the past decade since its accession to the WTO. "All foreign companies registered in China are Chinese enterprises. Their innovation, production and business operations in China enjoy the same treatment as Chinese enterprises," Hu said. He said the package plan and the related policy measures that the Chinese government introduced to counter the international financial crisis had also provided good opportunities for the growth of all enterprises in China, foreign companies included. BEIJING, Jan. 18 (Xinhua) -- Major foreign media have been positive in their coverage of Chinese President Hu Jintao's recent interview with two U.S. newspapers. On the eve of his state visit to the United States, Hu answered questions concerning major domestic and international issues in a written interview with reporters from Wall Street Journal and Washington Post on Monday. Japanese newspaper Tokyo Shimbun said President Hu stressed the need to reform the U.S. dollar-based international financial system and expressed disagreement with the U.S. criticism of the slow appreciation of the Chinese yuan. He also hoped the parties to the Six-Party talks on denuclearization of the Korean Peninsula would work actively to resume dialogue. Japanese newspaper Mainichi Shimbun said Hu called on the international community to further advance international financial system reform. Hu said the financial crisis sparked by the collapse of Lehman Brothers Holdings Inc. in 2008 was rooted in serious defects in the existing financial system and the monetary policy of the United States had a major impact on global liquidity and capital flows. "Therefore, the liquidity of the U.S. dollar should be kept at a reasonable and stable level," Hu said. Hu said "the current international currency system is the product of the past," but he did not dispute the U.S. dollar's role as the global reserve currency. He said it "will be a fairly long process" before the yuan could become an international reserve currency. German newspaper Frankfurter Allgemeine Zeitung said the Chinese president agreed that China and the United States should be partners for cooperation in broader areas and abandon the zero-sum Cold War mentality. Hu wrote in the interview that both countries should respect each other's sovereignty and territorial integrity. He also expressed concerns over U.S. monetary policy. German newspaper Suddeutsche Zeitung said, before his visit, Hu expressed his confidence while saying the current international currency system was "the product of the past." Though it will take a long time for the yuan to compete with the U.S. dollar as the global dominant currency, Hu had no doubt about the development trend. German newspaper Handelsblatt also referred to Hu's quote that the current international currency system was "the product of the past," but noted he made no compromise on the continuing debate over the right exchange rate. Beijing "cannot accept" U.S. demands of yuan appreciation, it quoted him as saying. BEIJING, Jan. 17 (Xinhua) -- Chinese President Hu Jintao said Monday that following the path of peaceful development is a solemn commitment of the Chinese government and people to the international community. "It is a policy that we will always adhere to," Hu said in a written interview with reporters from both Wall Street Journal and Washington Post prior to his state visit to the United States. "Specifically, it means that we will achieve national development by our hard and creative work, by reforming and improving our institutions, and by maintaining friendship and mutually beneficial cooperation with other countries," he said. According to Hu, China has been committed to the independent foreign policy of peace and has developed friendship and cooperation with all countries on the basis of the Five Principles of Peaceful Coexistence. "We stand for equality and mutual respect between countries. Like other countries in the world, China must uphold its own sovereignty, territorial integrity and development interests," he said. "At the same time, we are willing to properly handle differences and disagreements in state-to-state relations in accordance with the basic norms governing international relations and the principle of mutual understanding, mutual accommodation, dialogue and consultation," he said. "Over the years, relations between China and other Asia-Pacific countries, including the United States and our Asian neighbors, have grown steadily, and together we have contributed to development in the Asia-Pacific region," he said. He pointed out that mutual trust between China and other countries in this region has deepened in the common response to tough challenges, and the cooperation has continuously expanded in the pursuit of mutual benefit and win-win outcomes. "At present, relations between China and other Asia-Pacific countries face unprecedented opportunities. China is ready to work with other countries to seize opportunities, meet challenges and promote peace and development in the region and beyond," he said. BEIJING, Jan. 17 (Xinhua) -- Chinese President Hu Jintao said Monday that China is still the largest developing country in the world. "We need to make long and hard efforts if we are to build a moderately prosperous society in all respects and basically achieve modernization," he said. Hu made the remarks in a written interview with both the Wall Street Journal and Washington Post before his upcoming state visit to the United States, due to kick off on Jan. 18. Hu said the Eleventh Five-Year Program period was a truly eventful one in the course of China's development. Facing the complex changes at home and abroad and the major risks and challenges, China adhered to the Scientific Outlook on Development, strengthened and improved macro-regulation and gave full play to the basic role of market in resources allocation, he said. China also took proactive steps to curb the unstable and unhealthy factors in the economic operation, and maintained steady and relatively fast growth of the national economy and social stability and harmony, he added. "We continued to put people's interests first and paid more attention to developing social programs and improving people's livelihood," he said. Hu said the per capita incomes of urban and rural residents are estimated to have risen at an average annual rate of over 9.3 percent and around 8 percent respectively in the past five years. Population below poverty line in the rural areas was noticeably reduced. Education, social security, health care and other social programs developed more rapidly, he said. In response to a question on China's inflation risk, Hu said the rise of the overall price level has a very strong structural feature, yet it is on the whole moderate and controllable. "We have the confidence, conditions and ability to stabilize the overall price level," he said. Chinese President Hu Jintao has met with visiting US Defense Secretary Robert Gates in Beijing. The two spoke highly of the discussion which comes in the leadup to Hu Jintao's visit to Washington. Welcoming Gates, Hu says the visit shows the importance the two countries attach to the development of military-to-military relations. The Chinese President says Gates' visit signals new progress in exchanges by the two nations' armed forces, and he believes it will help strengthen understanding and mutual trust, and promote the development of China-US relations. President Hu points out military exchanges between the two countries is a major component of bilateral ties. He hopes the defense departments of the two sides will respect each other's major concern and enhance dialogue and communication on the basis of equality, respect, trust, and mutual benefit. President Hu adds that China attaches great importance to the development of Sino-US relations. He emphasizes a harmonious Sino-US relationship will not only benefit the people of both nations, but people around the globe. Gates thanked President Hu Jintao for the warm reception. He says US President Barack Obama is looking forward to meeting President Hu in the US later this month. Gates says the current situation poses new opportunities for military exchanges between the two countries. Gates made positive remarks about his visit, and praised the agreement both sides achieved during his trip. The US defense secretary says the US will work with China in building mutual trust and enhancing communication. The relationship between China and the US has grown to be one of the most important in the world, but it has not always gone smoothly. The year 2010 alone witnessed bilateral ties shift from tense and fractious, to warmer. President Hu Jintao's visit to US next week will inevitably have a profound and far-reaching significance on relations between Beijing and Washington. This photo from 2006 was taken during President Hu Jintao's first visit to the United States after taking office. Recalling those moments, the CEO of the US Center for Strategic and International Studies, John Hamre, sighs with regret, saying people in America don't really know about China. Hamre says his generation grew up during Cold War, at time when China was considered a military threat and an enemy. But that changed during Hamre's first visit to China in 2001. The first half of 2009 was described by western media as the "honeymoon" of Sino-US ties. But China and America then witnessed a series of disagreements and contradictions in trade, military cooperation and approaches to global issues. Fortunately, the two countries are being more mature in dealing with those frictions. Zhang Yesui, Chinese Anbassador to US, said, "There are always new problems arising in the development of bilateral ties. But I believe that the common interests will always prevail over differences. Cooperation, after all, is the mainstream of bilateral ties." In 2006, it had been reported that Hu Jintao's meeting with the then President George W. Bush had successfully smoothed bilateral trade ties -- a major achievement of the Chinese president's visit. Since the end of 2010, tensions have been turned to positive interaction. Many people hope the handshake between President Hu Jintao and Barack Obama next week will create new momentum in bilateral ties. WASHINGTON -- China and the United States have agreed to build a cooperative partnership based on mutual respect and mutual benefit, according to a joint statement issued here Wednesday. "China and the United States are committed to work together to build a cooperative partnership based on mutual respect and mutual benefit in order to promote the common interests of both countries and to address the 21st century's opportunities and challenges," it said. The China-US joint statement was issued after official talks between visiting Chinese President Hu Jintao and his US counterpart Barack Obama at the White House. "China and the United States are actively cooperating on a wide range of security, economic, social, energy, and environmental issues which require deeper bilateral engagement and coordination, " it said. "The two presidents shared a deep belief that a stronger China-US relationship not only serves the fundamental interests of their respective peoples, but also benefits the entire Asia-Pacific region and the world," it said. The two sides reaffirmed their commitment to building a positive, cooperative, and comprehensive China-US relationship for the 21st century. Recognizing the importance of the common challenges that they face together, China and the United States decided to continue working toward a partnership that advances common interests, addresses shared concerns, and highlights international responsibilities. Recognizing that the relationship between China and the United States is both vital and complex, they reiterated the importance of deepening dialogue aimed at expanding practical cooperation and affirmed the need to work together to address areas of disagreement, expand common ground, and strengthen coordination on a range of issues. The two sides agreed to work further to nurture and deepen bilateral strategic trust to enhance their relations. Both leaders support efforts to build a more stable, peaceful, and prosperous Asia-Pacific region for the 21st century. Both sides underscored the importance of the Taiwan issue in China-US relations. The Chinese side emphasized that the Taiwan issue concerns China's sovereignty and territorial integrity, and expressed the hope that the US side will honor its relevant commitments and appreciate and support the Chinese side's position on this issue. The US side stated that the United States follows its one-China policy and abides by the principles of the three China-US joint communiques. China and the United States affirmed that a healthy, stable, and reliable military-to-military relationship is an essential part of President Hu's and President Obama's shared vision for a positive, cooperative, and comprehensive China-US relationship. The two nations believe they have a common interest in promoting peace and security in the Asia-Pacific region and beyond, and agreed to enhance communication and coordination to address pressing regional and global challenges. The two presidents recognized the vital importance of working together to build a cooperative economic partnership of mutual respect and mutual benefit. China and the United States agreed to continue their close consultations on action addressing climate change as they view the issue as well as energy security two of the greatest challenges of our time. The two nations also agreed to take concrete steps to enhance people-to-people exchanges. Hu arrived in the US capital of Washington Tuesday for his second state visit aimed at enhancing the positive, cooperative and comprehensive relationship between China and the United States. His last visit was in April 2006. CCTV interview: Past and future of Sino-US ties CCTV reporter Tian Wei interviewed Professor Yan Xuetong, director of the Institute of International Studies at Tsinghua University. He shared his insights into the development of the Sino-US ties in the past decades, and the positions of the two world powers in the future. BEIJING, Jan. 19 (Xinhuanet) -- Since Barack Obama was sworn in as President of the United States in 2009, President Hu Jintao has met him seven times. Their meetings have pushed China-US relations to a higher level. Peter Koveos looks at their encounters. The seventh meeting between President Hu Jintao and his US counterpart Barack Obama took place in November 2010, in Seoul, South Korea. During that meeting, they determined to advance their positive, cooperative and comprehensive bilateral relations and develop a partnership in common interests. The meeting was seen as an extension of President Obama's state visit to China in 2009. One of the most essential outcomes of the four-day visit was a China-US joint statement announced which reiterated the importance of maintaining a positive, cooperative and comprehensive relationship to the two sides. According to the statement, both countries are committed to develop steady and healthy economic and trade ties. They also pledge to honor all outcomes made at the Strategic and Economic Dialogue, the G-20 and APEC meeting. Regarding the Strategic and Economic Dialogue, it's a brilliant result of President Hu Jintao and President Obama's first meeting in April 2009 in London. It's also a significant way for the two sides to discuss a wide range of regional and global political, strategic, security and economic issues. After two year's of development, China-US ties have been quite stable, but there are still some road blocks. Zhang Yesui, Chinese Ambassador to US, said, "Right now, it's the key point for China-US relations which has improved a lot, but they also face some new challenges. A stable and developing relationship between China and the US benefits not only the people of both countries, but also the Asia-Pacific area, even the peace, stability and development of the world. " There have been some periods of cooling down of relations between China and the United States since Obama took office in 2009, especially when Washington announced the delivery of military weapons to Taiwan, a great harm to the core interest of China. And trade conflicts have also contributed to the cooling relations. President Hu's visit to Washington will help both countries deepen their exchanges around various issues concerning the two countries, and realize a win-win result. WASHINGTON, Jan. 19 (Xinhua) -- Chinese President Hu Jintao said here Wednesday that important consensus was reached during his talks with U.S. President Barack Obama. "We had an in-depth exchange of views and reached important agreement on China-U.S. relations and major international and regional issues of shared interest," President Hu told a joint press conference with Obama following their meeting. The Chinese leader said both sides "agree to further push forward the positive, cooperative and comprehensive U.S.-China relationship and commit to work together to build a China-U.S. cooperative partnership based on mutual respect and mutual benefit so as to better benefit people in our own countries and the world over." Both sides also agreed to strengthen exchanges and cooperation in economy and trade, energy and environment, science and technology, infrastructure construction, culture and education, counter-terrorism, non-proliferation, law enforcement and other areas so as to achieve mutual benefit, according to the Chinese president. "We believe expansion of military exchanges and cooperation will be conducive to deepening mutual trust between our two countries," Hu said. While stressing that China-U.S. cooperation has great significance for the two countries and for the world, the Chinese leader said the two sides "should firmly adhere to the right direction of our relationship; respect each other's sovereignty, territorial integrity and development interests; promote the long-term sound and steady growth of China-U.S. relations and make even greater contributions to maintaining and promoting world peace and development." During President Hu's state visit, the two countries had signed a number of cooperation agreements. "These will inject fresh momentum into our bilateral cooperation and create a great many job opportunities for our two countries," Hu said. The Chinese leader reaffirmed China's firm commitment to the path of peaceful development and a win-win strategy of opening up. "China is a friend and partner of all countries, and China's development is an opportunity for the world," he said. Addressing the same press conference, Obama said cooperation between the two countries is good for the two sides and for the whole world. "Along with our G-20 partners, we've moved from the brink of catastrophe to the beginning of global economic recovery," he said. Noting China is one of the top markets for American exports, Obama said the annual U.S. exports to China in goods and services support "more than half a million American jobs." He praised China's extraordinary economic growth that "has lifted hundreds of millions of people out of poverty. "This is a tribute to the Chinese people," he added. The U.S. leader also expressed his satisfaction with the reaching of dozens of deals between the two sides that will increase U.S. exports "by more than 45 billion U.S. dollars." Hu, who unfurled his first state visit to the United States Tuesday since Obama took office in 2009, just concluded his eighth meeting with Obama before the press conference. Before the talks, a grand welcome ceremony for President Hu was held at the White House. Hu said at the ceremony that his visit is aimed at increasing mutual trust, enhancing friendship, deepening cooperation and pushing forward the positive, cooperative and comprehensive China-U.S. relationship for the 21st century. WASHINGTON, Jan. 19 (Xinhua) -- China and the United States have agreed to build a cooperative partnership based on mutual respect and mutual benefit, according to a joint statement issued here Wednesday. The China-U.S. joint statement was issued after official talks between visiting Chinese President Hu Jintao and his U.S. counterpart Barack Obama at the White House. "China and the United States are actively cooperating on a wide range of security, economic, social, energy, and environmental issues which require deeper bilateral engagement and coordination," it said. "The two presidents shared a deep belief that a stronger China-U.S. relationship not only serves the fundamental interests of their respective peoples, but also benefits the entire Asia-Pacific region and the world," it said. The two sides reaffirmed their commitment to building a positive, cooperative, and comprehensive China-U.S. relationship for the 21st century. Both sides underscored the importance of the Taiwan issue in China-U.S. relations. The Chinese side emphasized that the Taiwan issue concerns China's sovereignty and territorial integrity, and expressed the hope that the U.S. side will honor its relevant commitments and appreciate and support the Chinese side's position on this issue. The U.S. side stated that the United States follows its one-China policy and abides by the principles of the three China-U.S. joint communiques. Hu arrived in the U.S. capital of Washington Tuesday for his second state visit aimed at enhancing the positive, cooperative and comprehensive relationship between China and the United States. His last visit was in April 2006. WASHINGTON, Jan. 19 (Xinhua) -- U.S. President Barack Obama said on Wednesday that cooperation between the United States and China is good for both countries and the world. "I absolutely believe that China's peaceful rise is good for the world and it's good for America," Obama told a joint press conference after talks with Chinese President Hu Jintao at the White House. The U.S. president said the development of China has brought unprecedented economic growth to more people and more quickly than any time in history. "We also think that China's rise offers enormous economic opportunity," he said. Obama praised China's efforts to expand the country's domestic demand, that offers opportunities for U.S. businesses and ultimately translates into U.S. jobs. Hu unfurled his first state visit to the United States Tuesday since Obama took office in 2009. WASHINGTON - China and the United States on Wednesday agreed on $45 billion in US export deals and to give US companies greater access to China's $88 billion-plus government contracts market at the start of President Hu Jintao's four-day state visit. White House officials said the agreements included a $19 billion contract to buy 200 Boeing aircraft for delivery between 2011 and 2013. "From machinery to software, from aviation to agriculture, these deals will support some 235,000 American jobs -- and that includes many manufacturing jobs," US President Barack Obama said at a joint press conference with Hu. Another deal involving GE builds on an existing partnership with the Chinese Ministry of Railways to bring Chinese high-speed rail technology to the United States, and for GE to manufacture locomotives for China. The White House also trumpeted deals in various stages of development involving Honeywell, Caterpillar, Westinghouse Electric, a unit of Japan's Toshiba Corp, and other companies. The announcements served to underscore the theme of economic cooperation struck by Hu and Obama. In the meeting with Chinese and US business leaders, Hu said he saw "a promising future" for US-China trade and pledged to maintain a "transparent, just, fair, highly efficient investment climate" for foreign firms. WASHINGTON, Jan. 19 (Xinhua) -- Chinese President Hu Jintao said on Wednesday that China is always committed to protection and promotion of human rights. Addressing a joint press conference with U.S. President Barack Obama, Hu said China has made enormous progress in human rights recognized widely in the world. "China recognizes and respects the universality of human rights. And at the same time, we do believe that we also need to take into account the different national circumstances when it comes to the universal value of human rights," Hu said. Noting that China is a developing country with a huge population and in a crucial stage of reform, Hu said China faces many challenges in economic and social development, and a lot still needs to be done in China in terms of human rights. "We will continue our efforts to improve the living standard of the Chinese people and will continue our efforts to promote democracy and the rule of law in our country," Hu said. The Chinese president said China is also willing to conduct exchanges and dialogues with other countries in terms of human rights on the basis of mutual respect and the principle of non-interference in each other's internal affairs. "In this way, we'll be able to further increase our mutual understanding, reduce our disagreements and expand our common grounds," Hu said. Hu made the remarks after he and Obama held talks under "candid, pragmatic and constructive atmosphere" and reached important consensus. 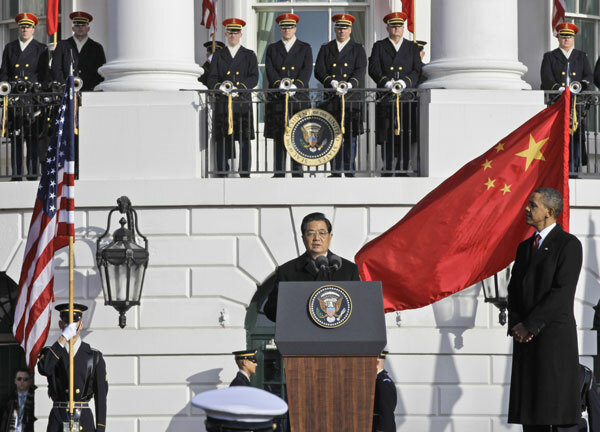 WASHINGTON - President Hu Jintao was welcomed to the White House on Wednesday with full honors that included a 21-gun salute and red-carpet greeting as he and his US counterpart Barack Obama seek to open a new chapter in Sino-US relations. Hu pulled up to the White House as part of a highly choreographed arrival, complete with welcomes from Obama, Vice-President Joe Biden and their wives and a long line of Cabinet members and dignitaries. Hu and Obama stood to attention as a military band played both national anthems. The two leaders reviewed troops on the South Lawn, then approached a rope line where they shook hands and greeted a group of children and young people holding Chinese and US flags. In his speech, Hu pledged a new chapter in "cooperation as partners". "China and the United States share broad common interests and important common responsibilities," Hu said. He said the two countries should adopt a long-term perspective, seek common ground while reserving differences, and work together to achieve sustained, sound and steady development of relations. "I hope that through this visit, our two countries will advance the positive, cooperative and comprehensive relationship and open a new chapter in our cooperation as partners," Hu said. To that end, Hu suggested that partnership should be based on mutual respect, mutual benefit, joint efforts to meet challenges and extensive involvement of people. "China and the US should respect each other's choice of development path and each other's core interests," Hu said. Obama, in a welcome speech, also touted US-China relations: "We have an enormous stake in each other's success. "Even as our nations compete in some areas, we can cooperate in others," he said. "What Deng Xiaoping said long ago remains true today: there are still great possibilities for cooperation between our countries," Obama said. The last 30 years of relations were marked by continued exchanges and increased mutual understanding, he said, before adding that Hu's visit serves to lay the foundation for deeper prosperity between their two nations in the next 30 years. Obama concluded his speech in Chinese: huanying (welcome). As Hu was greeted with the spectacular ceremony, the White House announced on Wednesday that China will purchase $45 billion in US exports, including a $19 billion deal for 200 Boeing airplanes. In addition to the Boeing deal, China will also invest in US exports from agriculture, telecommunications and technology companies, including General Electric, Honeywell and Navistar. The White House said the deals will support up to 235,000 jobs in the US. Hu was at the White House for a day of meetings on security, trade, economic and other matters. Capping the day will be a lavish, pomp-filled state dinner, only the third of Obama's two-year presidency - he held state dinners for India in 2009 and for Mexico last year. President Hu Jintao arrived in Washington Tuesday afternoon (local time) for his four-day highly-exposed state visit to the United States. China has become a profit center for enterprises from the United States. Statistics from the Ministry of Commerce of China indicate that by the end of 2010, US companies had invested $65.22 billion in more than 59,000 projects in China. President Hu Jintao said in Washington Wednesday noon that American investment in China is welcomed and pledged to provide transparent, fair and highly efficient investment environment for investors including those from the United States. WASHINGTON - With President Hu Jintao arriving in Washington DC on Tuesday, more and more Americans are hoping the United States will build a stronger relationship with China rather than limit the growth of China's power. A new global survey by the Chicago Council on Global Affairs finds that more than two-thirds of US citizens prefer the United States to undertake friendly cooperation and engagement with China instead of trying to constrain its rising power. In the survey of more than 2,500 adults, three-quarters of respondents believe that someday China's economy might grow to be as large as the US economy, while only a minority holds the view that the development of China as a world power is a "critical" threat. "Basically how I view China's rising is not as something scary and threatening as you've seen in a lot of American newspapers. I view China as a nation that we need to work with a lot more in the future diplomatically, as well as in economic issues," said Elisa Rosoff, a 20-year-old undergraduate majoring in foreign relations in George Washington University. "It's just exciting for someone of my age going through a power shift between nations of the world that China becomes more economically powerful and the US is being forced to recognize that." While US citizens do not see the rise of China as highly threatening at this point, they are keeping an eye on it, showing some concern about economic relations and hedging against a potential future military threat, according to the survey conducted in June 2010. Douglas Paal, vice-president for studies at the Carnegie Endowment for International Peace, explained earlier this month in a briefing of President Hu's state visit that there are "deep concerns" among US citizens as China becomes stronger. "Americans need some reassurance that China understands that the international system within which China is now prospering is one that is worth preserving," he said. "China should not try to upset the apple cart because it feels that it is finally back on the world stage with a strong economy and an improving military position." As for Hu's upcoming visit, some Americans are seeing an opportunity to build better ties between the two countries, while others' expectations are fairly limited. "I think only good can come out of President Hu's state visit," said Dan Suffoletta, an American employee in Levi Strauss & Co. "My belief is that when China and the US are having a dialogue and working to walk through things that relate to trade and get things rebalanced, it can be good for both countries." However, Marvin Fong, a US-born Chinese who works in the financial industry, said that the expectation is simply that the tensions that have been developing between China and the US might be lower after this meeting. "I hope we can address some of the tensions about the economy, monetary policy and North Korea because there are lots of issues that recently China and the US have disagreed on and right now it's just like each side is entrenching itself," he said. Ahead of Hu Jintao's visit, CCTV correspondent interviewed the US Secretary of State Hillary Clinton in Washington. Clinton emphasized the special role of the two world powers. She said relations between China and the US are at a crucial juncture, both countries should strengthen dialogue and communication in broader fields. Chinese President Hu Jintao's upcoming visit to the United States is vital to pushing forward bilateral ties, Chinese Ambassador to the United States Zhang Yesui said Saturday. In an interview with Chinese journalists in Washington, Zhang said this year marks the 40th anniversary of the rapprochement between the two countries as well as the beginning of the second decade of the 21st century. Zhang noted that China-US relationship is at a critical period, with two countries making strides in vigorously developing cooperation in various areas, while new challenges arise. At such a time, the visit of President Hu next week will be especially meaningful in pushing forward bilateral ties in the new era. China-US relations have maintained general stability and achieved marked progress since the establishment of diplomatic ties, which has become one of the most important bilateral relations in the world, he said. The two countries have conducted constant communication and dialogues, maintained close economic and trade relations, witnessed frequent exchanges of personnel and enjoyed a wide range of cooperation fields. The two countries have far more common interests than disagreements, dialogue and cooperation is always the defining feature of this relationship, he added. Zhang said China and the United States have different domestic environment, social systems as well as historic and cultural identities. They are also at different stages of development. It is normal for the two sides to have different views and even divisions in certain issues. Amid deepened globalization with more pressing global challenges,Zhang said, China-US ties needed to be viewed in a new perspective. China-US relationship is not a zero-sum game. As long as the two sides work together, enhance dialogue, increase mutual trust and widen cooperation, they can create a win-win situation. He stressed that a stable and developing China-US relationship benefits not only the two peoples, but also contributes to peace, stability and development of the Asia-Pacific region and the world at large. President Hu's visit will give great impetus to the development of China-US relations at a higher level. Authorities are looking to boost China's image overseas by broadcasting a short film on major media outlets in the US when President Hu Jintao starts his State visit there next week. Wang Zhongwei, deputy director of the State Council Information Office (SCIO), said Wednesday that one of two national publicity films shot last year will soon be broadcast on various outlets in the US, including major media and big screens at New York's Times Square, Beijing News reported. There are two versions of the film - one 30 seconds long and the other one minute long - and features prominent Chinese figures, ordinary people from different walks of life, and celebrities including basketball star Yao Ming, Wang said. Government agencies have broadcast national image films overseas before. In 2009, the Ministry of Commerce launched a 30-second advertisement to promote "Made in China" products on overseas news media outlets including CNN, China Central Television (CCTV) reported. The upcoming film aims to send a friendly message to the world under the theme "Hello world, here we come," People's Daily reported earlier. After broadcast in the US, the film will also be shown in Europe, Latin America and the Middle East, Wang said. A female worker from the publicity department of Lintas China, the advertising company that shot the film, told the Global Times on condition of anonymity that the film was produced under the instruction of the SCIO. Shen Wangshu, deputy director of the Institute of Capital Cultural Development at the Beijing Academy of Social Sciences, told the Global Times that a long-term strategic effort was needed to promote the national image. "In terms of the publicity film, the authorities could learn from how other countries promoted themselves with their pavilions during the Shanghai World Expo," Shen said. Çin Cumhurbaşkanı Hu Jintao ABD Başkanı Barack Obama'nın daveti üzerine dün gittiği başkent Washington'da ABD ziyaretine başladı. Çin Cumhurbaşkanı Hu Jintao ABD Başkanı Barack Obama'nın daveti üzerine dün (18 Ocak) gittiği başkent Washington'da ABD ziyaretine başladı. Hu Jintao havaalanında yaptığı yazılı açıklamada, önce ABD halkına yeni yıl dileğinde bulunarak Çin halkından ABD halkına selam getirdiğini belirtti. Hu Jintao açıklamasında, Çin ve ABD arasındaki diplomatik ilişki kurulmasından bu yana geçen 32 yıl içinde tarafların ortak çabasıyla ikili ilişkilerdeki olumlu gelişmenin sürdüğünü belirtti. Hu, halen büyük değişiklikler yaşanan uluslararası arenada Çin ve ABD'nin sahip olduğu ortak çıkar alanlarının genişlediğini, ortak sorumlulukların arttığını ve işbirliği geleceğinin güçlendiğini hatırlattı. Hu Jintao, ziyaretin karşılıklı güveni arttırmayı, dostluğu pekiştirmeyi, işbirliğini derinleştirmeyi ve 21 yüzyıla girerken Çin-ABD ilişkilerini ilerletmeyi amaçladığını ifade etti. Hu Jintao, Çin'in ABD'yle ikili ilişkileri karşılıklı saygı ve yarara dayalı ortak kazanç temelinde geliştirmeye hazır olduğunun altını çizdi. Çin ve ABD Washington'da ortak bir bildiri yayınladı. Yeni yüzyılda Çin-ABD ilişkilerinin geliştirilmesi için çaba harcanacağını yineleyen bildiride, her iki ülkenin ortak çıkarlarını korumak ve 21. yüzyılının fırsatlarını ve sorunlarını karşılamak için karşılıklı saygı ve yarara dayalı bir işbirliği ortaklık ilişkisini kurmak yolunda çaba harcayacağı açıklandı. Bildiride, iki ülkenin ortak çıkar alanlarının artırılması ve her iki tarafı ilgilendiren sorunların çözülmesi amacıyla ikili ilişkileri pekiştirme, ortaklık ilişkileri geliştirme ve uluslararası sorumluluk üstlenmek noktasında anlaşma sağlandığı kaydedildi. Bildiride, bütün bunların yanı sıra Taiwan ve insan hakları sorunlarıyla iki ordu arasındaki ilişkiler gibi konulardaki tutumun da belirlendiği kaydedildi. Bildiride, iki ülkenin üst düzey temasları yoğunlaştırarak yasama organları arasındaki görüş alışverişinin korunması önemini vurguladığı ifade edildi. Bildiride, ayrıca Çin ve ABD'nin Asya-Pasifik ve diğer bölgelerde barış ve güvenliğin bir an önce sağlanmasının her iki tarafın ortak çıkarlarına olduğunu savunduğu vurgulandı. Karşılıklı yarara dayalı geniş kapsamlı ekonomik ortaklık ilişkilerinin geliştirilmesi konusunda fikirbirliği sağlayan Çin ve ABD, Mayıs ayında kapsamlı ekonomik işbirliği çerçevesini daha da belirli hale getirecek. Yeni ekonomik çerçeve kapsamında, makro ekonomik politikalarda temas ve işbirliğinin pekiştirilmesi, uluslararası serbest ticaret ve yatırımlara hız verilmesi, ticari korumacılığın kaldırılması, daha dengeli ticari ilişkilerin ilerletilmesi, telif ve patent haklarının korunması ve global finans sisteminin güçlendirilmesi gibi alanlarda işbirliği ele alınacak. Taraflar ayrıca, iklim değişikliği, enerji ve çevre koruma konusunda da işbirliğini güçlendirecek ve kültürel temasları genişletecekler. Her iki lider de, Çin Cumhurbaşkanı Hu Jintao'nun ziyaretinin ikili ilişkileri daha da hızlandıracağı ve sağlam ikili ilişkilerin yalnız iki halkın temel çıkarlarına değil, bütün Asya-Pasifik bölgesi ve hatta dünyaya yararlı olduğu görüşünde birleşti. 1. At the invitation of President Barack Obama of the United States of America, President Hu Jintao of the People's Republic of China is paying a state visit to the United States of America on January 18-21, 2011. During his visit, President Hu also met with Vice President Joseph Biden, will meet with U.S. Congressional leadership, and will visit Chicago. 2. The two Presidents reviewed the progress made in the relationship since President Obama's November 2009 state visit to China and reaffirmed their commitment to building a positive, cooperative and comprehensive China-U.S. relationship for the 21st century, which serves the interests of the Chinese and American peoples and of the global community. The two sides reaffirmed that the three Joint Communiques issued by China and the United States laid the political foundation for the relationship and will continue to guide the development of China-U.S. relations. The two sides reaffirmed respect for each other's sovereignty and territorial integrity. 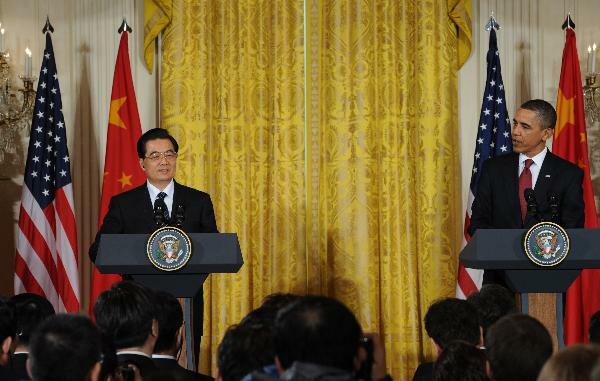 The Presidents further reaffirmed their commitment to the November 2009 China-U.S. Joint Statement. 3. China and the United States are committed to work together to build a cooperative partnership based on mutual respect and mutual benefit in order to promote the common interests of both countries and to address the 21st century's opportunities and challenges. China and the United States are actively cooperating on a wide range of security, economic, social, energy, and environmental issues which require deeper bilateral engagement and coordination. The two leaders agreed that broader and deeper collaboration with international partners and institutions is required to develop and implement sustainable solutions and to promote peace, stability, prosperity, and the well-being of peoples throughout the world. 4. Recognizing the importance of the common challenges that they face together, China and the United States decided to continue working toward a partnership that advances common interests, addresses shared concerns, and highlights international responsibilities. The two leaders recognize that the relationship between China and the United States is both vital and complex. China and the United States have set an example of positive and cooperative relations between countries, despite different political systems, historical and cultural backgrounds, and levels of economic development. The two sides agreed to work further to nurture and deepen bilateral strategic trust to enhance their relations. They reiterated the importance of deepening dialogue aimed at expanding practical cooperation and affirmed the need to work together to address areas of disagreement, expand common ground, and strengthen coordination on a range of issues. 5. The United States reiterated that it welcomes a strong, prosperous and successful China that plays a greater role in world affairs. China welcomes the United States as an Asia-Pacific nation that contributes to peace, stability and prosperity in the region. Working together, both leaders support efforts to build a more stable, peaceful, and prosperous Asia-Pacific region for the 21st century. 6. Both sides underscored the importance of the Taiwan issue in China-U.S. relations. The Chinese side emphasized that the Taiwan issue concerns China's sovereignty and territorial integrity, and expressed the hope that the U.S. side will honor its relevant commitments and appreciate and support the Chinese side's position on this issue. The U.S. side stated that the United States follows its one-China policy and abides by the principles of the three China-U.S. Joint Communiques. The United States applauded the Economic Cooperation Framework Agreement between the two sides of the Taiwan Strait and welcomed the new lines of communications developing between them. The United States supports the peaceful development of relations across the Taiwan Strait and looks forward to efforts by both sides to increase dialogues and interactions in economic, political, and other fields, and to develop more positive and stable cross-Strait relations. 7. China and the United States reiterated their commitment to the promotion and protection of human rights, even as they continue to have significant differences on these issues. The United States stressed that the promotion of human rights and democracy is an important part of its foreign policy. China stressed that there should be no interference in any country's internal affairs. China and the United States underscored that each country and its people have the right to choose their own path, and all countries should respect each other's choice of a development model. Addressing differences on human rights in a spirit of equality and mutual respect, as well as promoting and protecting human rights consistent with international instruments, the two sides agreed to hold the next round of the China-U.S. Human Rights Dialogue before the third round of the Strategic and Economic Dialogue (S&ED). 8. China and the United States agreed to hold the next round of the resumed Legal Experts Dialogue before the next Human Rights Dialogue convenes. China and the United States further agreed to strengthen cooperation in the field of law and exchanges on the rule of law. China and the United States are actively exploring exchanges and discussions on the increasing role of women in society. 9. China and the United States affirmed that a healthy, stable and reliable military-to-military relationship is an essential part of President Hu's and President Obama's shared vision for a positive, cooperative, and comprehensive China-U.S. relationship. Both sides agreed on the need for enhanced and substantive dialogue and communication at all levels: to reduce misunderstanding, misperception, and miscalculation; to foster greater understanding and expand mutual interest; and to promote the healthy, stable, and reliable development of the military-to-military relationship. Both sides noted the successful visit of Secretary of Defense Robert Gates to China earlier this month, and that the United States welcomes Chief of the PLA General Staff General Chen Bingde to the United States in the first half of 2011. Both sides reaffirmed that the Defense Consultative Talks, the Defense Policy Coordination Talks, and the Military Maritime Consultative Agreement will remain important channels of communication in the future. Both sides will work to execute the seven priority areas for developing military-to-military relations as agreed to by Secretary Gates and General Xu Caihou, Vice Chairman of the Central Military Commission in October 2009. 10. China and the United States agreed to take specific actions to deepen dialogue and exchanges in the field of space. The United States invited a Chinese delegation to visit NASA headquarters and other appropriate NASA facilities in 2011 to reciprocate for the productive visit of the U.S. NASA Administrator to China in 2010. The two sides agreed to continue discussions on opportunities for practical future cooperation in the space arena, based on principles of transparency, reciprocity, and mutual benefit. 11. China and the United States acknowledged the accomplishments under the bilateral Agreement on Cooperation in Science and Technology, one of the longest-standing bilateral agreements between the two countries, and welcomed the signing of its extension. China and the United States will continue to cooperate in such diverse areas as agriculture, health, energy, environment, fisheries, student exchanges, and technological innovation in order to advance mutual well-being. 12. China and the United States welcomed progress by the China-U.S. Joint Liaison Group on Law Enforcement Cooperation (JLG) to strengthen law enforcement cooperation across a range of issues, including counterterrorism. China and the United States also agreed to enhance joint efforts to combat corruption through bilateral and other means. 13. The two sides agreed that high-level exchanges are indispensable to strong China-U.S. relations, and that close, frequent, and in-depth dialogue is important to advance bilateral relations and international peace and development. In this spirit, both Presidents look forward to meeting again in the coming year, including in the state of Hawaii for the U.S.-hosted 2011 Asia-Pacific Economic Cooperation (APEC) Leaders' meeting. China welcomed Vice President Biden for a visit in 2011. 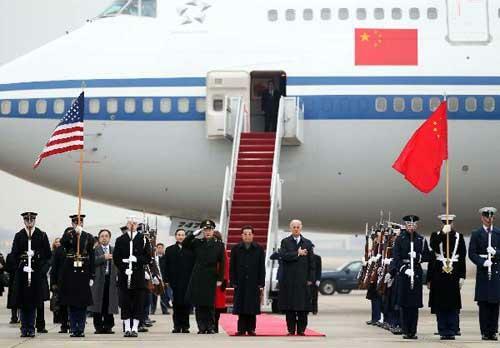 The United States welcomed a subsequent visit by Vice President Xi Jinping. 14. The two sides praised the S&ED as a key mechanism for coordination between the two governments, and agreed to hold the third round of the S&ED in Washington, D.C., in May 2011. The S&ED has played an important role in helping build trust and confidence between the two countries. The two sides also agreed to hold the second meeting of the High-Level Consultation on People-to-People Exchange in the United States in the spring of 2011, and the 22nd meeting of the China-U.S. Joint Commission on Commerce and Trade (JCCT) in China in the second half of 2011. The two sides agreed to maintain close communication between the foreign ministers of the two countries through mutual visits, meetings, and other means. 15. The two sides emphasized the importance of continued interaction between their legislatures, including institutionalized exchanges between the National People's Congress of China and the U.S. Senate and House of Representatives. 16. The two sides believe that China and the United States have a common interest in promoting peace and security in the Asia-Pacific region and beyond, and agreed to enhance communication and coordination to address pressing regional and global challenges. The two sides undertake to act to protect the global environment and to work in concert on global issues to help safeguard and promote the sustainable development of all countries and peoples. Specifically, China and the United States agreed to advance cooperation to: counter violent extremism; prevent the proliferation of nuclear weapons, other weapons of mass destruction, and their means of delivery; strengthen nuclear security; eliminate infectious disease and hunger; end extreme poverty; respond effectively to the challenge of climate change; counter piracy; prevent and mitigate disasters; address cyber-security; fight transnational crime; and combat trafficking in persons. In coordination with other parties, China and the United States will endeavor to increase cooperation to address common concerns and promote shared interests. 17. China and the United States underlined their commitment to the eventual realization of a world without nuclear weapons and the need to strengthen the international nuclear non-proliferation regime to address the threats of nuclear proliferation and nuclear terrorism. In this regard, both sides support early entry into force of the Comprehensive Nuclear Test Ban Treaty (CTBT), reaffirmed their support for the early commencement of negotiations on a Fissile Material Cutoff Treaty in the Conference on Disarmament, and agreed to work together to reach these goals. The two sides also noted their deepening cooperation on nuclear security following the Washington Nuclear Security Summit and signed a Memorandum of Understanding that will help establish a Center of Excellence on Nuclear Security in China. 18. China and the United States agreed on the critical importance of maintaining peace and stability on the Korean Peninsula as underscored by the Joint Statement of September 19, 2005 and relevant UN Security Council Resolutions. Both sides expressed concern over heightened tensions on the Peninsula triggered by recent developments. The two sides noted their continuing efforts to cooperate closely on matters concerning the Peninsula. China and the United States emphasized the importance of an improvement in North-South relations and agreed that sincere and constructive inter-Korean dialogue is an essential step. Agreeing on the crucial importance of denuclearization of the Peninsula in order to preserve peace and stability in Northeast Asia, China and the United States reiterated the need for concrete and effective steps to achieve the goal of denuclearization and for full implementation of the other commitments made in the September 19, 2005 Joint Statement of the Six-Party Talks. In this context, China and the United States expressed concern regarding the DPRK's claimed uranium enrichment program. Both sides oppose all activities inconsistent with the 2005 Joint Statement and relevant international obligations and commitments. The two sides called for the necessary steps that would allow for early resumption of the Six-Party Talks process to address this and other relevant issues. 20. Regarding Sudan, China and the United States agreed to fully support the North-South peace process, including full and effective implementation of Sudan's Comprehensive Peace Agreement. The two sides stressed the need for all sides to respect the result of a free, fair, and transparent referendum. Both China and the United States expressed concern on the Darfur issue and believed that further, substantive progress should be made in the political process in Darfur to promote the early, comprehensive, and appropriate solution to this issue. Both China and the United States have a continuing interest in the maintenance of peace and stability in the wider region. 21. The two sides agreed to enhance communication and coordination in the Asia-Pacific region in a spirit of mutual respect and cooperation, and to work together with other Asia-Pacific countries, including through multilateral institutions, to promote peace, stability, and prosperity. 23. The two sides agreed to strengthen macroeconomic communication and cooperation, in support of strong, sustainable and balanced growth in the United States, China and the global economy. -- The United States will focus on reducing its medium-term federal deficit and ensuring long-term fiscal sustainability, and will maintain vigilance against excess volatility in exchange rates. The Federal Reserve has taken important steps in recent years to increase the clarity of its communications regarding its outlook and longer-run objectives.-- China will intensify efforts to expand domestic demand, to promote private investment in the service sector, and to give greater play to the fundamental role of the market in resource allocation. China will continue to promote RMB exchange rate reform, enhance RMB exchange rate flexibility, and promote the transformation of its economic development model.-- Both sides agree to continue to pursue forward-looking monetary policies with due regards to the ramifications of those policies for the international economy. The two sides affirmed support for efforts by European leaders to reinforce market stability and promote sustainable, long-term growth. 24. The two countries, recognizing the importance of open trade and investment in fostering economic growth, job creation, innovation, and prosperity, affirmed their commitment to take further steps to liberalize global trade and investment, and to oppose trade and investment protectionism. The two sides also agreed to work proactively to resolve bilateral trade and investment disputes in a constructive, cooperative, and mutually beneficial manner. 25. The two leaders emphasized their strong commitment to direct their negotiators to engage in across-the-board negotiations to promptly bring the WTO Doha Development Round to a successful, ambitious, comprehensive, and balanced conclusion, consistent with the mandate of the Doha Development Round and built on the progress already achieved. The two sides agreed that engagement between our representatives must intensify and expand in order to complete the end game. 26. The two leaders agreed on the importance of achieving a more balanced trade relationship, and spoke highly of the progress made on this front, including at the recent 21st Meeting of the Joint Commission on Commerce and Trade in Washington, D.C.
27. China will continue to strengthen its efforts to protect IPR, including by conducting audits to ensure that government agencies at all levels use legitimate software and by publishing the auditing results as required by China's law. China will not link its innovation policies to the provision of government procurement preferences. The United States welcomed China's agreement to submit a robust, second revised offer to the WTO Government Procurement Committee before the Committee's final meeting in 2011, which will include sub-central entities. 28. The two leaders acknowledged the importance of fostering open, fair, and transparent investment environments to their domestic economies and to the global economy and reaffirmed their commitment to the ongoing Bilateral Investment Treaty (BIT) negotiations, recognizing that a successful BIT negotiation would support an open global economy by facilitating and protecting investment, and enhancing transparency and predictability for investors of both countries. China welcomed the United States' commitment to consult through the JCCT in a cooperative manner to work towards China's Market Economy Status in an expeditious manner. China welcomed discussion between the two sides on the ongoing reform of the U.S. export control system, and its potential implications for U.S. exports to its major trading partners, including China, consistent with U.S. national security interests. 29. The two sides further acknowledged the deep and robust nature of the commercial relationship, including the contracts concluded at this visit, and welcomed the mutual economic benefits resulting from the relationship. 30. The two sides agreed to continue working to make concrete progress on the bilateral economic relationship through the upcoming S&ED and the JCCT process. 31. China and the United States recognized the potential for their firms to play a positive role in the infrastructure development in each country and agreed to strengthen cooperation in this area. 32. The two countries committed to deepen bilateral and multilateral cooperation on financial sector investment and regulation, and support open environments for investment in financial services and cross-border portfolio investment, consistent with prudential and national security requirements. The United States is committed to ensuring that the GSEs have sufficient capital and the ability to meet their financial obligations. 33. China and the United States agree that currencies in the SDR basket should only be those that are heavily used in international trade and financial transactions. In that regard, the United States supports China's efforts over time to promote inclusion of the RMB in the SDR basket. 34. The two countries pledged to work together to strengthen the global financial system and reform the international financial architecture. The two sides will continue their strong cooperation to strengthen the legitimacy and improve the effectiveness of the International Monetary Fund and Multilateral Development Banks (MDBs). The two sides will jointly promote efforts of the international community to assist developing countries, in particular the Least Developed Countries to achieve the Millennium Development Goals (MDGs). The two sides will also, in partnership with the Multilateral Development Banks, explore cooperation that supports global poverty reduction and development, and regional integration including in Africa, to contribute to inclusive and sustainable economic growth. 35. The two countries reiterated their support for the G-20 Framework for Strong, Sustainable and Balanced Growth and reaffirmed their commitments made in the Seoul Summit Declaration, including using the full range of policies to strengthen the global recovery and to reduce excessive imbalances and maintain current account imbalances at sustainable levels. The two sides support a bigger role for the G-20 in international economic and financial affairs, and pledged to strengthen communication and coordination to follow through on the commitments of the G-20 summits and push for positive outcomes at the Cannes Summit. 36. The two sides view climate change and energy security as two of the greatest challenges of our time. China and the United States agreed to continue their close consultations on action to address climate change, coordinate to achieve energy security for our peoples and the world, build on existing clean energy cooperation, ensure open markets, promote mutually beneficial investment in climate friendly energy, encourage clean energy, and facilitate advanced clean energy technology development. 37. Both sides applauded the progress made in clean energy and energy security since the launch of the China-U.S. Clean Energy Research Center, Renewable Energy Partnership, China-U.S. Joint Statement on Energy Security Cooperation, and Energy Cooperation Program (ECP). Both sides reaffirmed their ongoing exchanges on energy policy and cooperation on oil, natural gas (including shale gas), civilian nuclear energy, wind and solar energy, smart grid, advanced bio-fuels, clean coal, energy efficiency, electric vehicles and clean energy technology standards. 38. The two sides commended the progress made since the launch of the China-U.S. Ten Year Framework on Energy and Environment Cooperation (TYF) in 2008. They agreed to further strengthen practical cooperation under the TYF, carry out action plans in the priority areas of water, air, transportation, electricity, protected areas, wetlands, and energy efficiency, engage in policy dialogues, and implement the EcoPartnerships program. China and the United States were also pleased to announce two new EcoPartnerships. The two sides welcomed local governments, enterprises, and research institutes of the two countries to participate in the TYF, and jointly explore innovative models for China-U.S. energy and environment cooperation. The two sides welcomed the cooperation projects and activities which will be carried out in 2011 under the TYF. 39. The two sides welcomed the Cancun Agreements and believed that it is important that efforts to address climate change also advance economic and social development. Working together and with other countries, the two sides agreed to actively promote the comprehensive, effective, and sustained implementation of the United Nations Framework Convention on Climate Change, including the implementation of the Cancun agreements and support efforts to achieve positive outcomes at this year's conference in South Africa. 40. China and the United States have long supported deeper and broader people-to-people ties as part of a larger effort to build a cooperative partnership based on mutual respect and mutual benefit. Both sides agreed to take concrete steps to enhance these people-to-people exchanges. Both sides noted with satisfaction the successful Expo 2010 in Shanghai, and the Chinese side complimented the United States on its USA Pavilion. The two sides announced the launch of a China-U.S. Governors Forum and decided to further support exchanges and cooperation at local levels in a variety of fields, including support for the expansion of the sister province and city relationships. China and the United States also agreed to take concrete steps to strengthen dialogue and exchanges between their young people, particularly through the 100,000 Strong Initiative. The United States warmly welcomes more Chinese students in American educational institutions, and will continue to facilitate visa issuance for them. The two sides agreed to discuss ways of expanding cultural interaction, including exploring a China-U.S. cultural year event and other activities. The two sides underscored their commitment to further promoting and facilitating increased tourism. China and the United States agreed that all these activities help deepen understanding, trust, and cooperation. 41. President Hu Jintao expressed his thanks to President Obama and the American people for their warm reception and hospitality during his visit. The two Presidents agreed that the visit has furthered China-U.S. relations, and both sides resolved to work together to build a cooperative partnership based on mutual respect and mutual benefit. The two Presidents shared a deep belief that a stronger China-U.S. relationship not only serves the fundamental interests of their respective peoples, but also benefits the entire Asia-Pacific region and the world.